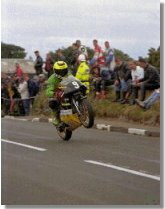 Ian Lougher burst onto the Road Racing scene in 1990, when he beat the invincible Steve Hislop in the Junior 250cc TT. Since then he has consistently achieved success at all the major road races, and is regarded as one of the current great Road Racers. We spoke to the versatile Welshman from his home in Rhoose about the prospects of another season in the saddle. Ian, firstly can I talk about last season? You scored wins at the North West, Ulster Grand Prix, Southern 100, Aberdare and Scarborough, so a good season on the whole? Yeah brilliant really. I wanted to make my mark on the bigger bikes really and being involved with V&M;Racing gave me encouragement to go for it. We didn't do any testing really before the North West; I literally did one lap in practice on the V&M bike but I finished fourth in the race. Then I was third at the TT on the same bike and I beat Rutter, which was the first time I beat one of my teammates, and then I won at the Ulster. As far as the Temple Auto Salvage R71 goes, well it was the same sort of bike as the V&M ones but not quite as quick. However if I ride for the same team this year, which looks likely, we hope to have it a bit quicker with a new ignition box on it, a close ratio gearbox and these sort of things that make it more competitive. I had a third at the North West, fourth in the F1 TT and I had a fifth and a third at the Ulster so it was pretty good. But the TT didn't quite go to plan. 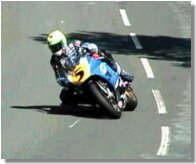 Were you disappointed not to have scored another win at the TT? Yeah I was a bit. I had hoped for a top three finish in one of the big bike races, which I almost got; I was lying second in the Senior when the gear linkage broke. In the 600 race I was happy to get on the rostrum, but in the 125 race I was definitely looking for the win but as it turns out I ended up switching from the Alan Patterson sponsored bike to the Mannin Collections bike and we only got one lap done in practice which wasn't enough, but that was my fault. In the 250 race McGuinness and Joey had Grand Prix type kitted bikes so I knew the best thing I could hope for was third and I ended up third. So overall it wasn't a bad TT but a win is a win you know. You proved on several occasions last season that you could be regarded one of the top Superbike riders now on the roads. How please were you with your performances aboard the Temple Auto Salvage R71? I was very pleased with the way I went. At the North West I rode all four bikes for the first time and I came away with a first, a second, a third and a fourth. The big bike was only finished at three o'clock in the morning for the North West and all I did was get ten laps in around Nutt's Corner, go to the practice session in the evening where I qualified second fastest behind Joey. Of course you need all the practice you can get but the second session was cancelled due to the weather so that was it. However I was made up to be lying third in the first race until I broke down and then finished third in the second race. So I was well pleased but it would have been nice to be able to push Jefferies and Rutter a bit more. You have been racing for quite some time now at the highest level mainly in the smaller classes, but it has only been of late that you have shown that you can mix it in the Superbike classes. Why do you think this is? It always annoyed me, which gave me so much motivation this year, that if you can ride a 125 people think you can't ride anything else. I mean Joey rode a 125 but he won big bike races before he rode the 125, so I went the wrong way I think. It wasn't until last year when I did well on the 600 and the 500 NSR after people had said 'You won't go well on that because it's a big bike or a four stroke' but I did. It's the same with Steve Hislop. He is still regarded as a TT specialist, which is crazy. I think he's won two British Championships and one of which was in the Superbikes. Ok, now let's talk about next year. There has been rumours linking you with V&M Racing and Paul Bird Motorsport, are you in a position to confirm any of you plans with us at the moment? Initially I was going to ride for Paul Bird on the factory SP1 that Toseland was going to ride on the short circuits. But then Toseland dropped the bombshell that he was leaving and the bike wasn't available so that was me out of it. I was disappointed because I think I could have gone well on it. I always seem to be in the wrong place at the wrong time. Back in 1990 when I won the 250 TT Yamaha or Honda would normally have been looking to take on riders but as it was they already had real good riders aboard. Then the following year I had a bad time and I never got the kit, which would have helped me, challenge for the top honours at the time. But anyway as far as this year goes, it looks as though I could be back on the Temple Auto Salvage bike or the V&M bikes but V&M haven't come back to me with an answer, so things are pretty much up in the air at the moment. If I do ride for him, we'll probably have a 600 as well although I don't know which manufacturer yet. In the smaller classes I will be riding the Mannin 125 Honda again, all being well I will be riding for Paul Bird on the 250. Which meetings are you planning to contest this season? Pretty much the same again but I'm planning on doing the British Production Championship. One of the new GSXR Suzuki's providing we get the sponsorship sorted out etc. I see. Then I suppose you'll be doing the TT, North West, Ulster, Southern, Scarborough, Aberdare etc? Yeah, I'll be doing all the roads again and I normally do a meeting in Germany at Schloutz, which is my favourite circuit in the world to race. It's a mixture of Hokenhiem and Donnington Park and it's a mega safe place. On the subject of the TT, the event is under criticism at the moment for various reasons, and some people claim that the entry is poor. What are your thoughts on the future of this prestigious event? I would agree that the entry is poor in some classes and obviously the two stroke side of things is dying because of the lack of money and it's sad to see it. But the thing is now somebody can buy an R6 for half the price and be competitive. I mean the Manx is always oversubscribed and the TT is pretty well subscribed I suppose but it's fair to say that a lot of the top riders don't go and they're obviously put of by the dangers etc. Do you think the organisers could attract a few more top riders as it were? Definatly. The prize money is so poor you see. People think the prize money is good compared to the short circuits but your there for two weeks. And I think it's fair to say that the prize money hasn't moved with inflation. No that's right. In 1976 you got £6000 for winning the Senior and it was only a few years a go that they actually raised it and you get £10,000 now. I asked Jack Wood ages a go why it hadn't gone up, and he said 'It has gone up. If you win the Formula 1 you get £13,000 now when you used to get £6,000.' But for the person that comes in sixth on probably the first non-works bike, the money has only gone up £150 since 1976. Like when Philip McCallen dominated for a while, he was getting a lot of money but nobody else was. So it's a total bluff. People outside the sport think that if you win you get £50,000 but the reality is that if you win a 125 race you get £2500. And do you think the money is there? It's got to be hasn't it? I would like to see a professional organisation take over the running of the event, something along the lines of what Billy Nutt has done for the North West would be good. As an event, it has become a bit prehistoric for want of a better word. Well it has really. I mean the paddock area for example shouldn't be on grass now you know. When it rains, well it always rains; the paddock is like a swamp. You shouldn't have to walk around that flippin' fence and push the bikes through the grass. It's crazy. It was all right in 1950 but these days everything is so complex with tyre warmers and stuff. Another thing I could mention was when I spoke with Colin Armes about having a wet weather flag instead of holding out the oil flag. But he chuckled and said 'Ian, that's not an oil flag it's a slippery surface flag'. So I said 'Yeah, but everywhere else it's an oil flag'. So when you come to somewhere and the flag is out you don't know whether it's wet or someone has come off or what. Then you would know it was wet and not oil. 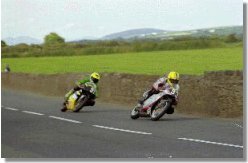 The TT will seem strange this year without the late great Joey Dunlop. You have raced against Joey many times throughout your career and I would be interested to know about your relationship with Joey? It was good. We always got on very well. I've raced against him for about ten years, drank with him quite a bit you know. I just admired the guy. The word I would use is respect. Joey was the sort of person you look to, to gauge your own performance. It will be weird without him. At thirty-six years old yourself, It must give you confidence to carry on racing when he was still winning at forty-eight years of age. Yeah, it makes you believe that you have a bit more left in you. 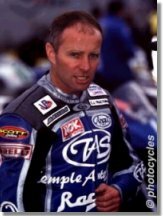 So without Joey and David Jefferies of course, who do you think are going to be you main rivals in the Superbike Races at the TT? Well obviously McGuinness will be there on the Fireblade which to be honest is not that bad a bike even though Moodie and Duffus didn't rate them, but at the Ulster Adrian Archibald rode well on his and it was only about four mile an hour down on me and I was probably about three mile an hour down on the V&M;bikes. Now that sounds like a lot in a straight line, but they handle well and get the power down good. And reports suggest that the two work's riders will be aboard 'trick' ones. They'll be there all right. So do you think Archibald will be pushing for a win? And do you have an outside tip? Well I would say Blair (Degerholm) but he's hurt himself so I don't know if he'll be able to ride. Other than the TT, which event do you most enjoy and why? The North West is one of my favourite although it never used to be. You have to rely on other riders a lot there. I enjoy the Ulster, North West all the roads really. You have always supported the Southern 100. Yeah I like the Southern. That was my first Road Race you know in 1983. I might have been there. I would have only been five years old, but I might have been there. Looking beyond this season Ian, how long do you intend to carry on racing Motor Cycles? Well about ten years a go I said I was jacking is so (laughs). I don't know really. I'm enjoying my racing more now than ever, so as long as I keep doing that, I'll carry on. However I couldn't just ride round. I would have to be competitive to enjoy it. Well it has been great talking with you. Is there anyone you would like to thank? Just everyone that has helped and supported me over the years. No problem, speak to you again soon.